Want to submit a guest piece to GameCola.net? Send a review, a top-10 list, a random opinion piece, photography, artwork, a letter to the editor, fanfiction, or just about anything else to pfranzen AT gamecola DOT net , and we just might make you Internet-famous. 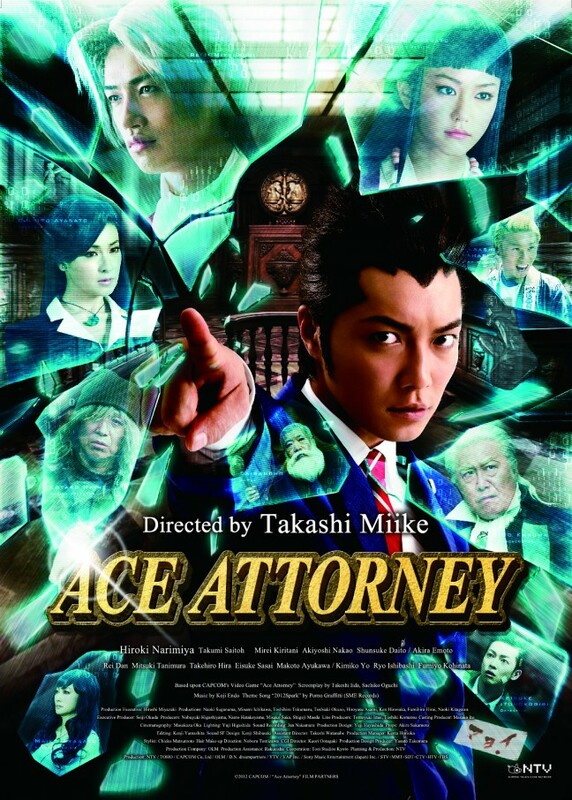 Recently I had the opportunity to watch a subtitled version of the new Ace Attorney movie that was released in Japan. (Thank you Internet.) And since the Ace Attorney games are highly appreciated here at GameCola, I decided that this would be a perfect opportunity to write GameCola’s first ever movie review!! Que the music! Now first off, when I saw the trailer for this thing, I was truly disappointed. I mean, the scenario sounded incredibly stupid, and every character had the same infuriatingly annoying voice. Nah, I’m just screwing with you. Seriously though, I thought it looked incredibly silly. I mean, the costumes were ridiculous, and it made the makers look like they were trying too hard with this movie. For example, look at Lotta Hart! I do realize that in the game, everyone looked silly, but it wasn’t as noticeable there as it is here. 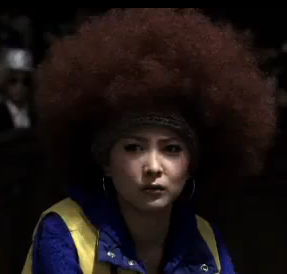 But heck for all I knew, being silly was probably what Toho was aiming for. So as the natural Ace Attorney fan I am, I got excited. My first impressions on the film was (you guessed it) its appearance. The sets are all either hand built, or actual places in Japan and they looked cool and realistic. I always like to give the makers credit when they build the sets from scratch instead of some CG animation in the background like in the new Star Wars movies, or (more recently) in the Sherlock Holmes movies. But the realistic tones that the sets give you are all debunked by the character’s appearance, although I was surprised by the performances that were being given by the cast members. Each actor represents their characters well and proud so props to them for that. Well, all of them except for Edgeworth at certain parts, which I found kind of weird to be honest. 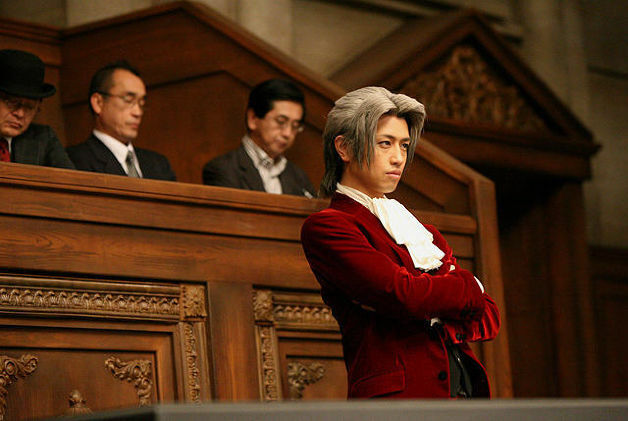 In one scene he acts very much like Edgeworth—he’s quiet, observant, gives icy glares here and there—but in other scenes you can’t help but notice that the actor is probably thinking “Oh god, please get me out of here. Somebody! Anybody! HELP ME! !” What gives? Maybe he found out what kind of fan-base Edgeworth has. (Apologies to every Edgeworth fan-girl out there in the world please don’t kill me). The film editing is weird. In one scene, you’re watching Phoenix and Maya investigating the boat shop, then it cuts to a clip of something completely unrelated really fast, then it cuts back to Phoenix and Maya. What the heck? I would understand if it was referred to later on like if it was a clue or something, but it went by so fast I could barely make out what it was. Then there’s (Spoiler alert!) von Karma’s breakdown where he’s basically walking around the courtroom saying the usual “Damn it’s” and “Curse you Wright,” and all of a sudden, he teleports to the other side of the shot continuing what he’s saying! Come on guys, you couldn’t shoot the scene multiple times, telling the actor to talk faster each time? This is something YouTube users do to cut for time, not to give a dramatic moment in a feature film! If it was intentional, I’ll be honest, I don’t get it. Speaking of things I don’t get in this movie, what is with everybody fainting? Apparently from what I’ve read, it’s a tradition in Japanese anime and Manga that every time someone says something incredibly stupid, everyone around them faints in amazement. Not to bag on Japanese culture or anything, but does that seem really stupid to anyone else besides me, to include that in a feature film? Anybody? The plot is almost the same as the game. It includes cases 1, 2, and 4. It barely has case 3, but it’s used just to introduce Edgeworth’s character and is shown at the same time as case 1. There are some minor differences between this plot and the game’s, but I can understand why they made them, and they fitted well in the story. The pacing is also a little weird. The first ten minutes don’t really explain much on how trials are held. Apparently, the movie just expects you to figure it out by yourself, and buy it. The first two cases just fly by in the first half of the film and it all feels rushed and forced, that is until you hit the second half. This is where the movie really starts to shine. The plot starts to slow down and take its time handing you the details on the story and the characters, making the viewer start to accept it. It does a really good job at setting up the tension during the trial scene, and making you eager to see what happens next. One thing I laughed at during the film was actually a filming mistake I noticed. In one scene, Maya is standing by Gourd Lake with an umbrella in her hand while wearing a Japanese fur coat and looking at someone on a boat. It then cuts to the person on the boat for a moment, then it cuts back to Maya at a different angle, and her coat is missing! What a total screw up. How did nobody catch that? Now, I’m not going to criticize the film makers for a simple mistake like this because almost every movie does it. For example, in Jurassic Park there’s the scene where the fat scientist is trying to leave the island with the dinosaur embryos during a storm, and he crashes his car. He finds the road down the hill and here you notice the sign on the road pointing up. In the next couple of shots you see the sign again, but this time it’s pointing to the left. Getting back on track, every movie makes simple mistakes, so I give this one a pass. Umbrella? Check. Coat? Edited out, duh. Most of the characters are developed really well, but the characters that I felt got wasted a little bit were Mia and Maya. Mia gets killed off so early in the film and unlike in the game, she doesn’t feel as important here as she was there. She just seemed like a soulless character who was trying to get revenge and happened to train a rookie defense lawyer while at it. She barley has any personality. The same could be said for Maya! With everything that’s going on in the story, there is barely enough time to establish her personality. You know the emotional scene at the end of case 4 where Maya leaves on the train? It’s in the movie, but only while the credits are rolling and there is barley any dialogue to support it, and the emotion of the scene is sucked right out of it. Instead of feeling, “Aw Maya is leaving,” you feel “Oh, she left.” Anyone going into this movie blind will think that the whole purpose of Maya was to put another woman in the movie and think that she was…well…useless. Oh, don’t give me that! Blame Toho, not me! One more thing I have to touch upon is the score. Any Ace Attorney fan knows that the series has really awesome/over-the-top music, and the fact that it’s in the movie, is just awesome. Once it comes on, you will know it immediately, and it comes on at the perfect times. The movie also has some great original music of its own. As it should, the score does a good job at investing the viewer into the scenario. Now I bet you’re wondering, with all my ranting and complaining, is there anything I like about this movie? Well, yes. The story is so well executed that by the end, you want to see von Karma fall. (And bang his head against the wall, but unfortunately that doesn’t happen.) You want to see Edgeworth off the hook. You want to see Phoenix wave the bullet in front of von Karma’s face and just yell “TAKE THAT MOTHA-@#$%ER! !” OK that doesn’t happen, but I wanted it to! My point is, despite its goofiness and pacing problems, you are still going to turn this movie off with a smile on your face. When a movie gets you so invested with the characters and the story that you want to see everything turn out right for them, that my friends, is good entertainment. This is a well-made film. Most of the characters are developed well, the acting is top-notch, the plot is given well, and if you’re not an Ace Attorney fan, it will keep you guessing until the end. Is this movie perfect? No. Was it meant to be? Not at all. This movie was clearly made for the fans of the games, as a thank you from Capcom. A lot of effort was put into it and it shows. It’s self-aware of what it is, and as a fan of the series I’m glad I saw it. Should there be a sequel? Hell no. Let this movie stand on its on for what it is, and what it is, is the best videogame-based movie out there. I give Ace Attorney 3 judge’s beards out of 5. I found it on youtube. Better act quick before it get’s taken down. Best videogame-based movie out there…and it’s only a 3 out of 5? That does not speak well of videogame-based movies. Both Street Fighter movies, both Mortal Kombats, all 5 Resident evil movies, Super Mario bros., Doom, both Silent hills, must I go on? You’re obviously forgetting the Oscar contender Double Dragon movie. And lets not forget the souless Pokemon movies. Plus, they are based on the show more than the games, so they only half count as video game movies. How about the unforgettable Max Payne movie? Have your parents ever told you to not play in traffic? If so, then Taz-Mania is the Super Nintendo game for your inner rebel.